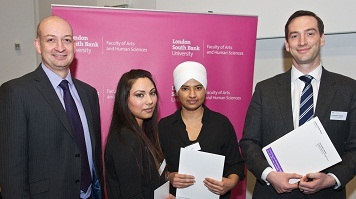 On Thursday the 23rd of January, the Faculty of Arts and Human Sciences (AHS) celebrated its 9th Annual Prize Giving Ceremony. The ceremony gives the Faculty a chance to recognise the exceptional and outstanding work of a small group of students who have 'gone the extra mile' in their academic efforts. The awards are given for excellent performances in each of our departments and are offered as a token of appreciation for their efforts by the Faculty, the University and sponsors from professional bodies, the business community and charitable trusts. The night was a great success and the Faculty would like to give special thanks to Hays, Barton Wilmore, Turley Associates, Hobbs Parker Property Consultants, Sweet and Maxwell , Chartered Institute of Housing, Traac, Ede & Ravenscroft, Royal Institute of Chartered Surveyors, The Royal Town Planning Institute, Routledge Cavendish, Oxford University Press, British Psychological Society, Tara Arts, Hammersmith United Charities, Park Plaza Westminster Bridge, Renaisi, Association for Tourism in Higher Education, LexisNexis UK. John Bennett Trust, Laurence Marlow, Stina Lyon, Yew Tree Projects, and the Denis Fitzgerald Memorial prize for their continued support and attendance at this event. Lastly, we would like to thank our award-winning students for their efforts and wish them every success in the future. For a list of this years winners, download the AHS Prize Giving 2014 programme (PDF File 2,588 KB).